Most of what we do as a point-of-purchase display and store fixture company involves designing and manufacturing freestanding displays either for the floor or the counter. That’s generally the nature of the POP display business. But what happens when a store has a clean floor policy whereby they don’t allow displays or your only opportunity is to put your product inline along side a sea of competitive products? Suddenly it gets a lot more difficult to differentiate your product and to drive sales. While some customers may be relieved that they don’t have to spend the money on a POP display, the reality is that off-shelf merchandising has shown to be more effective than inline merchandising, unless you have a well established and recognizable brand name. So let’s look at five different examples of effective inline merchandising. Surf City Garage- After several years of demonstrated success with freestanding displays in major automotive aftermarket stores, Surf City Garage landed an opportunity with Wal-Mart. The challenge, however, was that they would now be positioned inline in the automotive products aisle. Surf City Garage wanted to find a way to differentiate their enthusiast-grade automotive detailing products from the many other automotive products on the aisle. 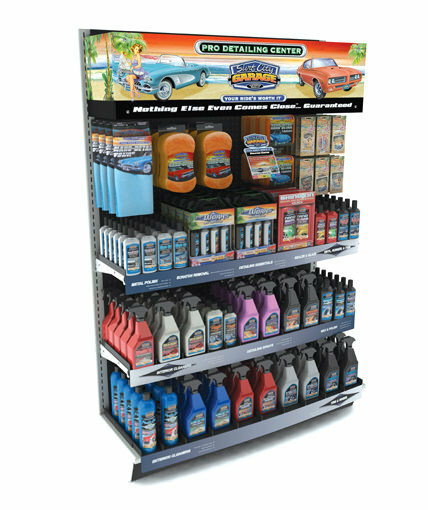 RICH LTD. worked with the Surf City Garage team to create a “store within a store” concept for their product set. We began by designing a large 3-D full-color vacuum formed header sign which served to set the boundaries for their “store” and to grab shoppers’ attention. It was unique on the aisle since everyone else was using flat signs instead of 3-D signs. Another key design element of the 4-ft. section was a prominent information graphic which we strategically placed in the center of the display. The graphic was designed to educate the shopper on the distinctive features and benefits of Surf City Garage’s products. Mounted on the end of a hook, the graphic played an important role in the educational sales process and also helped differentiate the “store” relative to other competitors who did not provide easy-to-digest detailed product information. Finally, the product assortment, which included everything from hanging microfiber towels to boxed products and spray bottles, was well organized and coordinated in a way that ensured a visually pleasing presentation. Chroma-Graphics- The inline merchandising challenge for Chroma-Graphics was how to fit as much product in a 4-ft. section as possible without compromising the product presentation. Chroma-Graphics has an extensive line of automotive decals that they sell through automotive aftermarket stores and other retailers. In the past they had utilized a static, tiered pocket design. The two problems with this approach were: (1) They could not fit as many SKUs as they wanted, and (2) the majority of the decal was covered up by the lower pockets. RICH LTD. designed a series of 4-sided, 20-pocket spinners that accomplished several things. First, it enabled Chroma-Graphics to fit significantly more product in the 4 ft. area. Second, the decals were now almost completely visible to the shopper rather than being hidden like they were with the tiered system. Third, the spinners created an opportunity to engage the shopper since the spinners needed to be spun to view all 4 sides of product. The net result of the new merchandising approach was a very significant lift in decal sales. Robanda- Our customer Robanda landed an opportunity to sell its line of Bodyography cosmetics in Pro-Duo stores. Pro-Duo is Europe's largest wholesale distributor of professional hair and beauty products with more than 190 stores in France, Belgium, The Netherlands, Germany and Spain. While Robanda had excellent success selling its products to professional salons and specialty retailers around the world with the help of freestanding displays, the Pro-Duo opportunity represented a challenge since it was an inline merchandising opportunity and it was a wholesale distributor retail setting which was expected to drive far less foot traffic than a typical retail store. RICH LTD.’s design team created an attractive, modular 4-shelf gondola display that featured 12 individual product modules, each of which had an informational graphic for the specific product contained in the module. We created strong branding using an overarching sign that spanned the 4-ft. section and attached to the outside modules on the top shelf. The display was fabricated using black and clear acrylic. It included tester stations with hinged clear acrylic dust covers. 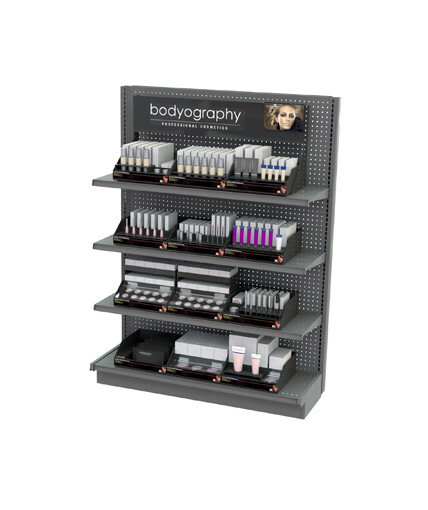 The display has been so effective that Bodyography sales have increased multiple-fold over expected sales. Stella D’oro- Our challenge with Stella D’oro was to come up with an innovative approach to merchandising the company’s line of cookies, breakfast treats and bread sticks using standard gondola shelving. Our solution was to create a unique, brand-building inline modular peg system that would grab shoppers’ attention and make the product stand out relative to other snack food products that were just traditionally merchandised on hooks. Our design featured a red polyurethane-coated MDF base that bolted to the gondola shelf, a series of modular green powder-coated metal frames with branded Stella D’oro digitally printed PVC awnings, and removable scanner hooks with shelf tags. Haynes Manuals- With over 200 titles and limited inline space in auto parts stores, Haynes Manuals faced a challenge similar to other manufactures with high SKU counts and not enough space to display them. In most retail settings, the company utilizes a tiered pocket system supplemented by a number of manuals displayed library style. As an alternative to the traditional approach, RICH LTD. designed a set of modular 12-pocket spinners, each of which spins independently. In an 8 ft. section, we were able to fit a total of 6 spinners. Each spinner had 3 levels or 36 pockets per spinner. We were able to increase the total number of titles in the 8-ft. section to 216 while also including branded header signs to promote the Haynes Manuals name. Similar to the Chroma-Graphics inline spinners, this solution increased the SKU count and invited the shopper to engage with the product vis-a vis the spinner design.